The XL Grote Prijs van Belgie was the sixth round of the 1983 Formula One Season, which saw Formula One return, for the first time in thirteen years, to the magical Circuit de Spa-Francorchamps. The return to one of F1's spiritual homes almost threw up a surprise victor in Andrea de Cesaris, but a poor stop for the Italian handed Alain Prost the honour of becoming the first winner at Spa since Pedro Rodríguez in 1970. De Cesaris went on to retire after a fuel injector failure, putting Patrick Tambay into second and Eddie Cheever onto the final step of the podium. The Spa circuit had been massively improved, in terms of safety, since F1's last visit. 1979 had seen the circuit length cut in half to seven kilometers, but the circuit's majestic setting in the heart of the Ardennes forest remained. Although the fast, flowing (and often fatal) run from Burnenville to Stavelot had been cut out, the circuit still retained some of the original layout, including the stunning Eau Rouge/Raidillon section. These changes were largely successful, with no further fatalities at the circuit in F1. It was, perhaps, appropriate then that F1 returned there, almost a year after losing one of its biggest names, Gilles Villeneuve, in accident at the same event a year before. This romantic return to an F1 favourite was not, however, enough to see Arrows retain Chico Serra for the weekend, as the team's search for sponsorship saw them hand a debut to Thierry Boutsen. Otherwise, the entry list remained as it had been from a week earlier in Monaco, although with seven kilometres of circuit available, the number of grid slots returned to its usual figure of 26. The Monaco battle had seen Nelson Piquet pull out a two point lead over Alain Prost in the championship, with Prost a further two points ahead of Patrick Tambay. Keke Rosberg's win had seen him leap up into fourth, ahead of John Watson, whose season was beginning to unravel. In the Constructor's battle, Ferrari emerged from Monte Carlo in the lead, although they only had a two point cushion to Renault coming into Belgium. Brabham, Williams and McLaren were next, all tied on 21 points (just four behind the scarlet cars) all with one win apiece. As in Monaco a week earlier, the driest session of the weekend proved to be practice, with all of the qualifying times being set in the session. It was also clear that Spa, despite lacking the flat-out sections that had defined it's earlies use in F1, favoured the turbo, with the top eight cars all given a boost by turbo, leaving Keke Rosberg, as he had often been in 1983, the first of the normal cars in ninth. As mentioned earlier, qualifying was another washout, meaning that the times from practice were to decide the grid. Hence Prost took pole, with Tambay second, while Andrea de Cesaris took an impressive third and Manfred Winkelhock took the ATS to seventh in an excellent display. McLaren learned from their mistake in Monaco, with both John Watson and Niki Lauda making it through, while Marc Surer was another to demonstrate his pace, taking tenth. Out of qualifying, once again, was the V12 Alfa Romeo engined Osella of Piercarlo Ghinzani, whose pace was starting to be questioned. Eliseo Salazar was the other man to fail to qualify, although his five second gap to Ghinzani was down to the car, rather than driver. Before the race, Renault asked the FIA to change the starting position of the pole side, which was originally on the left hand side of the start/finish straight. This would have placed Alain Prost on the outside of the track, on the racing line, for the La Source hairpin, which would, it was thought, give Patrick Tambay an advantage going into the first corner. The FIA agreed, with Prost now starting on the right hand side, and Tambay on the left, with the even positioned cars now all on the outside, and odd placed cars next to the pits. Other than this change, however, there were no further modifications to the starting order, although Michele Alboreto was to change his new Ford Cosworth DFY engine for the standard DFV engine after a spectacualr failure in the warm-up. The start of the race was a scene of confusion, as the FIA opted to abort the start as the lights went out. Although most of the drivers acknowledged the abortion, several started as if it were a normal start, with Andrea de Cesaris slithering around Prost to take the lead. Prost set off after the Alfa (which had a new set of turbo chargers fitted for the weekend), although their private duel was quickly calmed down by the marshalls. The field returned to the grid, as normal proceedure dictated, but the crews, whom were not meant to return, also gathered on the grid. The FIA decided to do a full restart proceedure, with five minute countdown before the restart. 16 drivers were to refuel during the race, so when the reformed grid lined up, fuel was the major concern. Marc Surer came into the pits for a service, which meant he forfitted tenth place and would have to start from the pitlane. After a second formation lap, the lights went out again, with de Cesaris having a carbon-copy start to take the lead. Prost slid neatly into second, with Tambay calmly taking third, while a bad start for Nelson Piquet promoted René Arnoux into fourth. The top seven would run together until the start of the pitstops, with Manfred Winkelhock and de Cesaris putting up brilliant defences against Keke Rosberg and Prost respectively. Riccardo Patrese lasted less than a lap with an engine failure, joined shortly afterwards by Mauro Baldi and debutant Thierry Boutsen with their own mechanical issues. Furtherdown, Derek Warwick, another to be fitted with a new turbo charger having destroyed his old one in the warm-up, and John Watson were slowly climbing through the field from their lowly starts. Watson's race was only to last until lap nine, however, after contact with Jean-Pierre Jarier ended both of their races. The race went quiet until the stops, when an issue for de Cesaris handed the lead to Prost leaving the Italian in third (Piquet having stayed out the longest). His issue was no match for Winkelhock's however, whom lost his right rear wheel going through Pouhon, sending the ATS (which was in sixth) out of the race. Prost stopped on lap 22, with de Cesaris only slightly behind as the Frenchman emerged, before the Alfa hit another problem. Arnoux pulled off on lap 23 with an engine failure, a fate shared Roberto Guerrero a lap later. It was also the fate of de Cesaris, whom ground to a halt on lap 26, promoting Piquet to second and Tambay to third. Eddie Cheever was now fourth, while Warwick was now in ninth, requiring a few more retirements to get what would have been a well deserved point. Although Niki Lauda fell with an engine failure, and a late charge allowed him to take Elio de Angelis, Warwick would miss out on the points by 25 seconds, having started in 22nd. Prost swept home to take his second win of the season, with Piquet falling to Tambay and Cheever in the closing stages of the race. Rosberg was left to finish in a lonely fifth, while Jacques Laffite claimed the final point in the second Williams, half a minute behind his team mate. First Grand Prix held at Spa-Francorchamps since the 1970 Belgian Grand Prix. First (and only) fastest lap for Andrea de Cesaris. 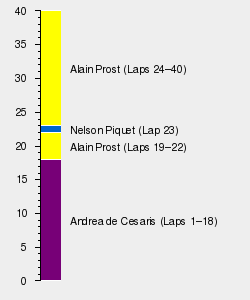 Only the top 5 drivers are displayed. Only the top 5 constructors are displayed.